Instagram Stories hasn’t been around for that long – the feature only launched in August 2016. But it has quickly become one of the very best ways for brands to drive engagement and connect with audiences. By November 2017, Instagram Stories had already topped over 300 million daily users. Since then, it has become a powerful channel for brand marketers who are looking to expand their businesses’ social marketing presence. Instagram’s Stories feature allows users to share pictures that don’t stay on your profile permanently. They are shared with followers at the top of a regular feed and are automatically deleted after 24 hours. You can enhance the images with filters, text, doodles, stickers, mentions of other users, location tags and more. Instagram Stories help to create a culture of inclusion by leaving viewings open to the public, by being searchable, and by using mentions, which allow users to feature other people in them. In addition, Instagram Live, which lets users live-stream stories to their contacts, creates an even more inclusive experience — an important part of interactive marketing for brands. Let’s take a look at some of the brands that are doing a fantastic job of using the tool to drive engagement. Hint Water is amazing at featuring its brand as a model for healthy living. The company is committed to showcasing how it helps its customers improve their health and their lives by taking care of their minds and bodies. 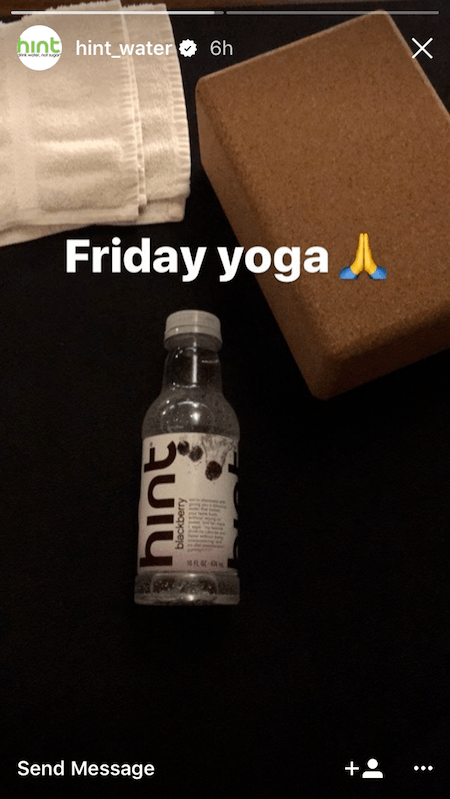 Hint water uses Instagram Stories to showcase images of yoga mats, exercise accessories and healthy lifestyle accouterments, and always include a bottle of their water in the photo or video. It’s a great example of a company that has built itself into a lifestyle brand by leveraging authentic content from its passionate community. Air Canada toes the line between creating fun quick stories that are both entertaining and add value. You never want your stories to be boring, but you also don’t want them to be too loud or flashy. In other words, make your posts pretty but not believable. Air Canada strikes that balance by showcasing people and travel in a fun and refreshing way without making it unrelatable. You can almost picture yourself dancing with the locals in Romania, like in this story! J. Crew started using Instagram Stories to promote blog posts that feature images of its apparel and a quick message from the brand. The company tends to highlight the main premise of an article and post high-quality images that drive traffic to its website. Take this one, for example, in which J. Crew uses three images to ask users to “Swipe Up” to read the company blog. The brand adds links to its images where users can “See More” and add text and coloring features in order to supplement the CTA and further engage users. Starbucks is phenomenal at Instagram Stories—it takes advantage of all the different features in order to highlight and attract users. For example, it showcases its latest flavors and offerings so that users will learn the details of the products and become interested in trying them. It’s a very simple model – Starbucks just uses text and stickers to make the images pop. It does take some design know-how to put together these types of appealing images, but with tools like Photoshop, it’s not a huge time investment. Instagram Stories are a fantastic marketing medium that brands can leverage in minutes. Consider A/B testing images and videos in Stories to see which ones are performing well and are resonating with your target audience. Usually, a spike in engagement is due to posts that are visually appealing, easy to read, and informative– so track your stories to see what works best for your viewers! For more tips and best practices on using authentic content to connect with your customers through Instagram Stories, contact us at hi@pixleeteam.com.